Yoga has been my primary path for cultivating more ease, resilience, and physical intelligence. 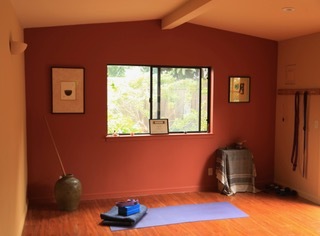 I have studied with Iyengar based teachers Donald Moyer and Mary Lou Weprin and the community of practitioners at the Yoga Room in Berkeley for over 30 years. I completed the Teaching Certification program in 2008. I have had a home practice of yoga and meditation for many years. We’ll meet in my new studio, a light filled space with wood floors and garden views, ideal for individual and small group instruction. The slower pace and deep breathing of a restorative yoga class triggers the parasympathetic nervous system from the very first pose. The overall calming effect on the nervous system sets a deeply relaxing tone for the class that comforts your mind and body down to the cellular level. No drop-ins, please. Class size limited. Repeats, welcome. Available in 3 session blocks.